What is Plagiocephaly and Brachycephaly? What is plagiocephaly and brachycephaly, and how do the terms tie in with flat head syndrome? Plagiocephaly and brachycpehaly are the two most common types of flat head syndrome seen in infants. If your baby has been diagnosed with one, the other or both, this post will provide you with the facts so that you can take active steps to prevent them from becoming permanent. 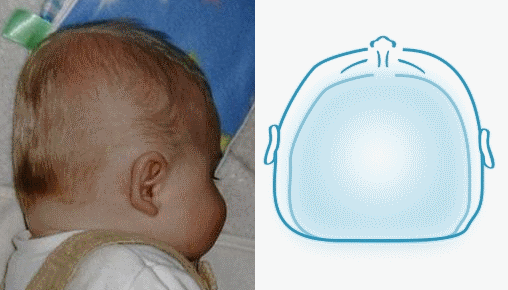 What is plagiocephaly? Plagiocephaly is the word used to describe a diagonal asymmetry of the head shape. 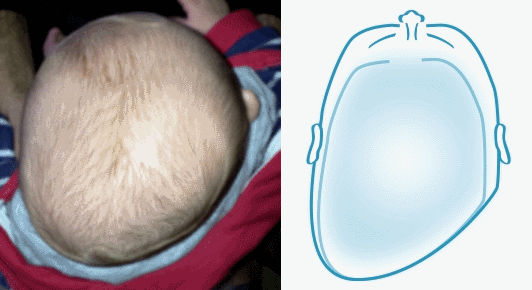 In particular, plagiocephaly is characterised by a flattening to one side at the back of the head and often coincides with some degree of facial asymmetry. What is brachycephaly? Brachycephaly on the other hand, describes a very wide head shape with a flattening across the back. Most of the babies we see have a combination of plagiocephaly and brachycephaly. Parents usually notice that their baby has an irregularly shaped head at about eight weeks. They are often told that it will correct itself naturally and that it is ‘just cosmetic’. However, recent studies suggest that this may not be the case and even if it is, active steps are required in order to prevent the deformity from getting worse or becoming permanent. Softened skull: babies are born with incredibly soft skulls, which enable them to pass through the birth canal, and accommodate the rapid brain growth that occurs during the first few months of life. As bone plates in babies’ skulls do not fuse until toddler age, this makes them highly susceptible to shape-change from a variety of factors- the position of the baby in the womb being just one of them. Multiple birth: flat head syndrome is common in multiple births as there is less room for infants to move around, placing added pressure on the soft bones of the skull. Premature birth: premature babies are also particularly susceptible as they don’t benefit from the mineralisation that occurs during the final few weeks of pregnancy. Additionally, premature babies can sometimes prefer to rest their head on one side as they are not yet able to move their head themselves, and because their skulls are even softer than full-term babies. After birth: pressure on the head after birth is one of the most common plagiocephaly causes, particularly where a lot of time is spent resting the head against flat surfaces. This problem is made worse by conditions like torticollis, a tightening of the neck muscle on one side, which can be treated through physiotherapy. We recommend that parents start repositioning as soon as a flattening becomes apparent. This can help prevent plagiocephaly and brachycephaly from getting worse and may even assist in its reversal. If any improvement can be achieved naturally, it will be during the first few weeks of life, usually up until around four months of age. When sleeping: put baby on their back to sleep, alternate the end of the cot they sleep to encourage sleep on different sides of the head, move baby’s nightlight to different sides of the room (babies tend to follow light with their eyes, and consequently their head – make sure this isn’t always in one direction), and make sure to check and change their head’s positioning when sleeping if necessary, away from the flattened side. When playing: engage in tummy time to strengthen important neck and trunk muscles. While awake, on a firm and flat surface, place baby on their front. This will also aid development and co-ordination. As leaving baby on their back for too long can create similar pressure to FHS on the back, tummy time reduces this too. When feeding and carrying: switch up the side you hold baby, to encourage equal movement between both sides of baby’s head. When travelling: if possible, limit time spent with baby in car seats and buggies, where baby’s head will rest on a firm flat surface for prolonged periods of time. Furthermore, use a sling or front carrier rather than walk baby in their car seat. Will Baby’s Plagiocephaly Self Correct? What Treatment is Available? Our experience is that if the plagiocephaly or brachycephaly is not improving on its own by five months of age, it probably won’t improve at all without further assistance. In these cases, our unique TiMband treatment can be used to gradually remould the head back to a more normal, symmetrical shape. This treatment is completely painless and takes between three and six months to complete depending on the degree of deformity and the age of the baby. Its extraordinary success rate can be seen in the thousands of babies we have treated to date – find us on Facebook for some recent stories, and to see before and after treatment pictures. At Technology in Motion, we can guarantee that once your baby has completed TiMband treatment, plagiocephaly will not return, and your baby’s head shape will not revert back to its pre-treatment shape. We usually have over 100 infants in treatment at any one time and are widely regarded as a leading clinical team in the management of flat head syndrome. To book a free, no-obligation assessment at your nearest clinic, call 0330 100 1800 or fill in our contact form today. 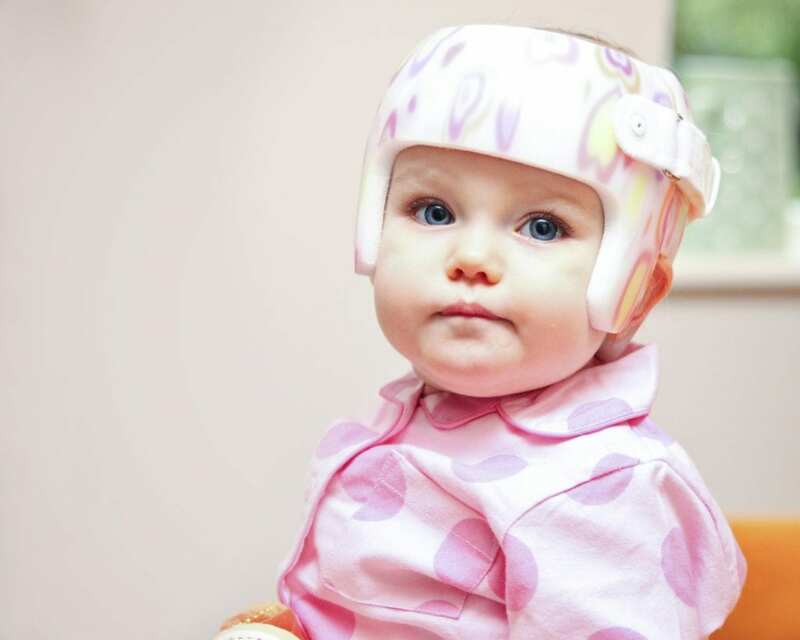 Read here for the full benefits of a plagiocephaly helmet. See our blog also for more plagiocephaly and brachycephaly resources, including links to additional places of advice and support.